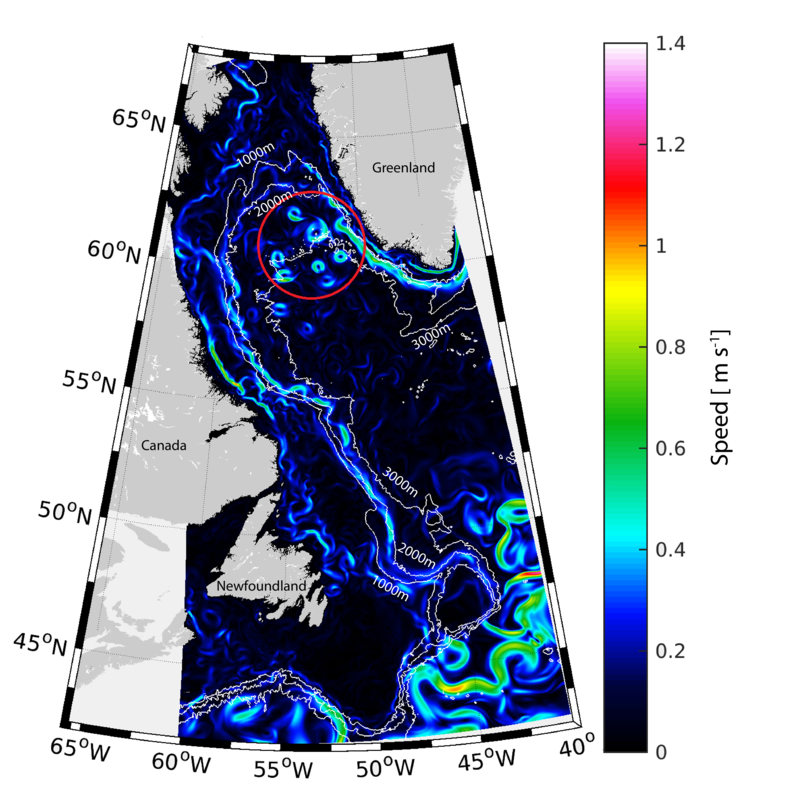 While the rest of the OSNAP team has been busy preparing the first continuous time series of the AMOC in the high-latitude North Atlantic from the OSNAP array measurements (link to Science paper), the Bower Lab has been steadily processing data from more than 120 deep-sea floats that were released in the deep currents of the AMOC between 2014 and 2017 as part of “OSNAP Floats”. 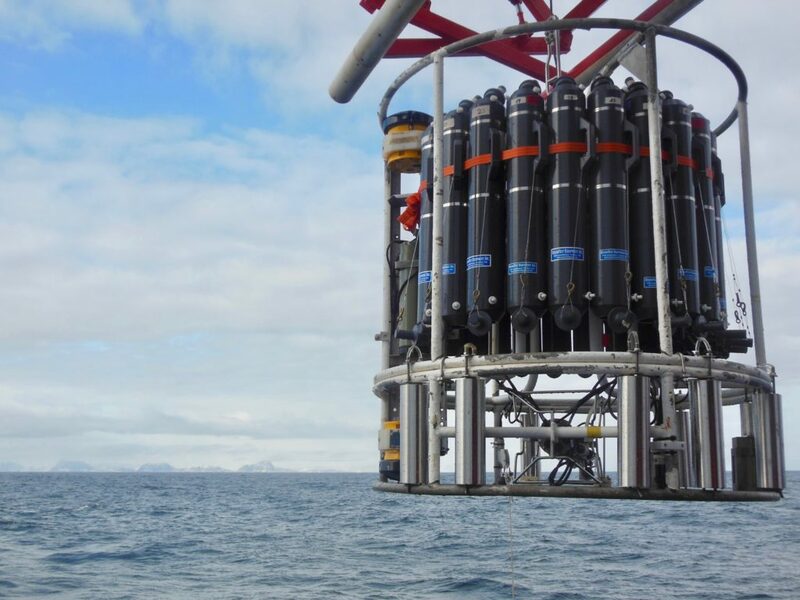 These so-called RAFOS floats (RAFOS stands for RAnging and Fixing Of Sound) were tracked continuously underwater using an array of 13 moored sound beacons spread throughout the subpolar region. Once a day during each float’s mission, the float “listened” for signals from the sound beacons, and internally recorded the time it heard each one (usually only 2-4 beacons were in range on any given day). After two years of collecting these “times-of-arrival” from the sound beacons, each float dropped a ballast weight, popped to the surface and transmitted all its stored data via satellite. We have been reconstructing each float trajectory by converting the acoustic travel times to distances, and triangulating float position for every day. It is always an exciting moment when the complete trajectory pops onto the computer screen, usually revealing some incredibly interesting pattern of the flow deep in the ocean. Nearly every diagram of the pathways of the lower limb of the AMOC in the subpolar North Atlantic show continuous lines of flow snaking around the rim of its three sub-basins: the Labrador, Irminger and Iceland Basins (e.g., Fig. 1). This view of the deep circulation has been shaped largely by our observations of the subpolar ocean around its edges, which almost all show a relatively strong deep boundary current transporting modified versions of the dense overflows (Iceland-Scotland Overflow Water and Denmark Strait Overflow Water) that feed the lower limb of the AMOC. When we track the pathways of individual fluid parcels, or large groups of them, we see a somewhat different view of the pathways of the deep AMOC (Fig. 2). This “Lagrangian” view—by which we mean the ocean circulation as observed by following individual fluid parcels, in contrast to the “Eulerian” view, which is constructed from current measurements at fixed locations—highlights the turbulent nature of the currents in some regions of the deep ocean. The float trajectories show a much messier view because deep ocean currents are not always orderly streams of water flowing smoothly along, but rather consist of blobs or patches of water 10-100 km in diameter swirling around like slow-motion hurricanes. In some regions, the Lagrangian and Eulerian views look similar, at least on the large scale. For example, most (but not all) of the floats released east of Greenland more or less follow the boundary around the southern tip of Greenland. In other regions however, the boundary-following pipe-like view seems completely inadequate to describe the deep pathways of the AMOC. For example, floats coming through the Charlie-Gibbs Fracture Zone (a deep gap in the mid-Atlantic ridge that separates the Iceland and Irminger Basins) do not, in general, follow the boundary of the Irminger Basin. Instead, the floats spread westward and even southward in a somewhat chaotic fashion. Also, some floats released in the deep boundary current transporting Iceland-Scotland Overflow Water southward in the Iceland Basin never make it to the Irminger Basin through gaps in the ridge, but instead drift southward within the eastern North Atlantic, apparently having escaped from the deep boundary current system altogether. So why do we care what pathways these deep waters take? For one practical reason—if we want to accurately monitor the strength of the deep AMOC, we better have a good idea where its major branches are so we can place our instruments judiciously. Also, the pathways of these deep water masses have an impact on how they are modified. A branch that carries deep waters along a slow, meandering interior pathway may lead to more stirring and modification of the water properties than would occur along a more direct, boundary-following path. This in turn affects how heat and other properties are re-distributed throughout the ocean. The Bower Lab is looking forward to the upcoming General Assembly of the European Geosciences Union in Vienna, Austria next week, where we will have the opportunity to showcase the many and varied discoveries emerging from OSNAP Floats. Fig. 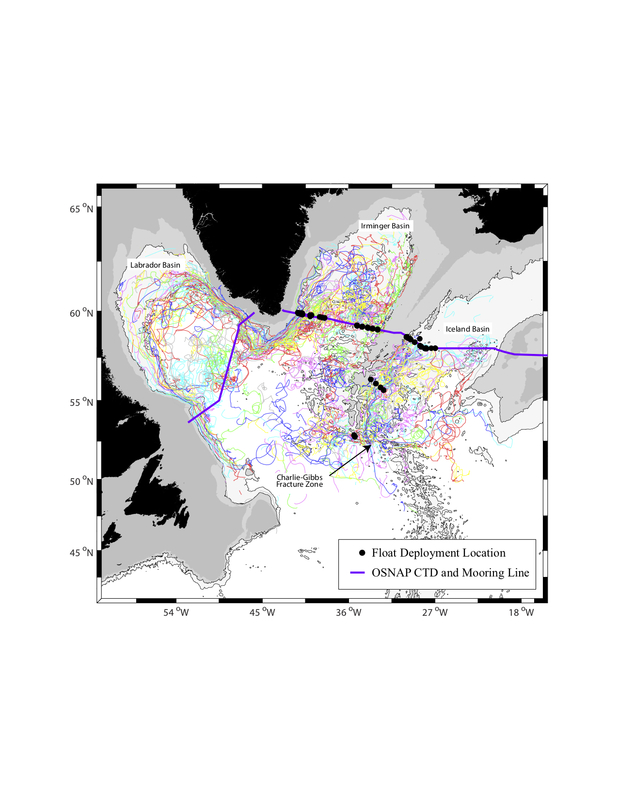 2: Trajectories of 123 RAFOS floats, tracked at depths from 1800 m to 2800 m between 2014 and 2018. Colors indicate individual float tracks. The Labrador Sea in the northwestern Atlantic Ocean is a bit like salad dressing: the multiple water layers present will not happily mingle with others nearby, just like oil and vinegar. Of course, this all changes when the salad bowl that is the Labrador Sea gets stirred up! Strong winter storms pass through the Labrador Sea, cooling the surface water and making it more dense. Should this cooling process continue, the density will increase until the surface layer will have the same density as the subsurface layer, allowing them to efficiently mix together – just like shaking a bottle of dressing. We call this ‘shaking’ deep convection. However, the Labrador Sea is not simply a 2-ingredient salad dressing mixture. A fresh and cold water cap is at the surface; this water originates from the Arctic and could be from melting of Greenland glaciers, sea-ice from the Beaufort Sea, or even runoff from one of the many rivers which discharge into the Arctic Ocean from Canada, northern Europe, and Russia. A warm and salty layer of water from the Atlantic Ocean exists below this. Further below is yet another water mass which is cold and salty, a product of mixing the two layers above it during the cold winter; we call this layer Labrador Sea Water. There are even more layers beneath, but I won’t get into them for now. These top three layers are important to the deep convection and water mass formation that previous blog posts have discussed. My PhD thesis revolves around the ocean layers within the Labrador Sea and how they are modified by a variety of sources, such as an input of freshwater, heat, or perhaps changes in the weather. As this region is notorious for its rough seas, particularly during the stormy winter, research cruises (see https://www.o-snap.org/fleur-de-sel-life/ ) tend to occur/gather data after the winter has passed when seas are calmer and the 12-point Beaufort sea state scale (see https://en.wikipedia.org/wiki/Beaufort_scale) goes from 10’s and 11’s down to more manageable single digits. Unfortunately, research cruises may therefore miss clues about the mixing and formation of water layers that happen during the convective season. I use computer models to investigate what may be occurring when research cruises are not around to gather data. While they are not without their own set of problems, models allow us a peek into the unknown from the comfort of a Beaufort 0 sea-state office. One portion of my research explores rotating circular features, which we call eddies, that form off the west coast of Greenland. 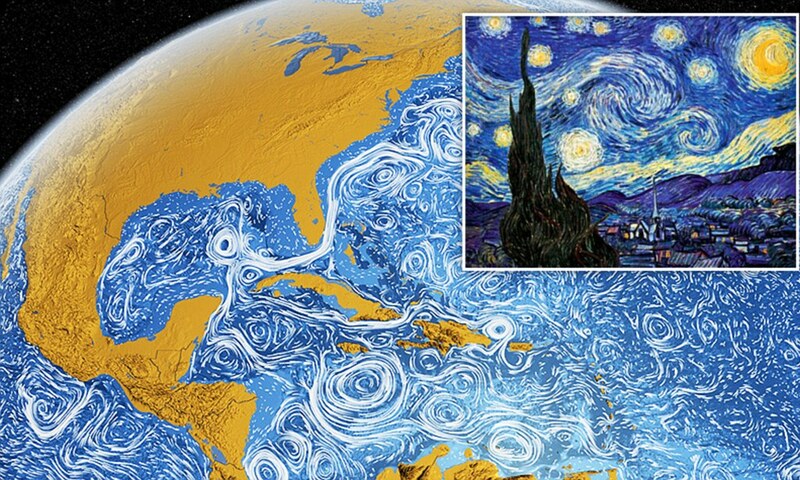 These eddies are produced via changes in the seafloor nearby. As the West Greenland Current moves alongside the west coast of Greenland, it carries both fresh and cold water at the surface as well as salty and warm water below. These eddies carry both water layers away from the coast and into the heart of the Labrador Sea. Both of these water masses impact the Labrador Sea in a different way, so these eddies are rather interesting and important features. However, these small events are notoriously difficult to represent within numerical models, especially multi-decade simulations. We had to get a little creative in order to make sure we would resolve these eddies as modelling such eddies requires a lot of computing resources. We set up a complex simulation which has a resolution of 1/60 of a degree, meaning this simulation should be able to resolve features where are larger than a few kilometers. The simulation requires over 600 CPUs and about 72 hours of real time to produce 40 days of simulation time. To put that into perspective, our regular simulations may use 60 CPUs and finish 2 years of simulation time in 72 real hours; quite the difference! We are interested in running this expensive simulation across 17 years, from 2002 to 2018, so we can capture variability across many years, though some quick math says that this simulation will take about a year to finish. But what do we gain by resolving the Labrador Sea at high resolution? Well-defined eddies is what we get! You can see those individual eddies within the red circle. From running this model we’ve so far learned that those eddies can last up to two years, meaning that as they travel southwest from the coast of Greenland they may encounter multiple winters and therefore be involved in multiple rounds of deep convection. I’m currently exploring how these eddies evolve through their lifetime in the Labrador Sea. We know they bring substantial heating into the region, limiting deep-water formation. Thus being able to detect them with our model is crucial in order to achieve an accurate spatial representation of convection. Lower resolution simulations may fail to resolve these features and thus their importance. Since they persist for multiple convective years, they may have a more complicated story than previously thought which I hope my research will help uncover. Numerical modelling allows for the scrutiny of such events as observations within the Labrador Sea may not provide the full information we seek. The first results from the OSNAP array, published this month in Science (https://science.sciencemag.org/content/363/6426/516), are incredibly exciting! Over the 21 months of data collected so far, it has been the conversion of warm, salty, shallow Atlantic water into colder, fresher, deep water east of Greenland that has dominated the overturning circulation and its variability. This challenges the prevailing view that deep water formation in the Labrador Sea to the west of Greenland is the major player in determining overturning variability. And it gives us some clues about how changes further north, in the Arctic Ocean, might affect things. A major motivation for measuring the overturning circulation with the OSNAP and other observational arrays arises from the expectation that the overturning will change as a result of human-induced climate change. The overturning circulation is predicted to weaken over the coming century, due to a warming and freshening of the high latitude North Atlantic. Part of the freshening expected in these critical deep water formation regions is due to changes in the amount of freshwater exported from the Arctic to the Atlantic, on both sides of Greenland. The Arctic Ocean has recently accumulated a large amount of freshwater, but we do not know if or when it will be exported to the Atlantic, or at what rate. My group in Oxford have been investigating changes in the amount of freshwater stored in the Arctic, and the reasons for them, in the hope that this will teach us something about the changes we might expect in freshwater export (https://agupubs.onlinelibrary.wiley.com/doi/full/10.1029/2017GL076870). We have deduced the relationship between winds over the Arctic and total Arctic freshwater storage in a climate model. We now know that if the winds over the Arctic change, it takes the system at least a decade to come into a new equilibrium, with a different amount of freshwater stored. Based on the relationship we deduce between winds and freshwater content, we estimate changes in Arctic freshwater content over the last century – and our time series agrees well with the limited observational data available (see figure), giving us confidence that the relationship is a useful description of the real world! 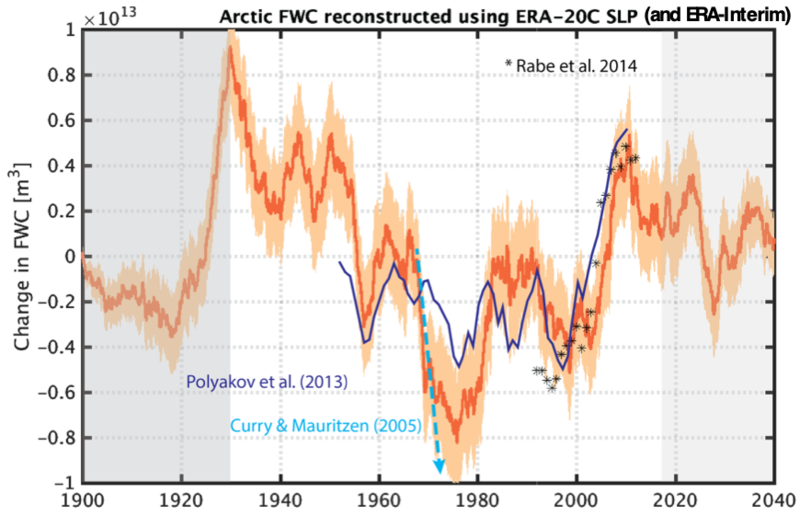 Our results suggest that the large increase in Arctic freshwater content since 1992 can largely be explained by historical changes in the winds driving the Arctic Ocean circulation (although we can’t rule out a smaller contribution from sea-ice melt). What’s more, this increase doesn’t seem exceptional compared to variability in our time series over the rest of the century, suggesting that it may simply be natural variability. Of course, changes in freshwater exported from the Arctic, natural or not, still have the potential to affect the overturning circulation! The long memory of atmospheric conditions revealed by our results is important because, provided we know what the winds have done, we can potentially predict changes in Arctic freshwater content a few years ahead. Based on our work so far, we expect Arctic freshwater content to decrease over the coming decade, and freshwater export to the Atlantic to increase. The OSNAP array is ideally-placed to detect any impact of this change on the high-latitude overturning circulation. Based on the OSNAP results so far, we might expect that Arctic freshwater export through Fram Strait to the Nordic Seas (rather than through the Canadian Archipelago to the Labrador Sea) will have the most impact. So we have several hypotheses that our continued OSNAP observations and modelling efforts will put to the test in the coming years! Collaborations in science are great, especially within a group as closely knit as OSNAP, but sometimes the most surprising things come out of totally different kinds of collaborations. I saw beautiful examples of this in a special exhibit at the Boston Science Museum during my time as a postdoc at WHOI. Collaborations between scientists and artists led to new or different interpretations of the things we know. An example is the interpretation of the work of colleague Larry Pratt on turbulent torusses, the equations of which were somewhat intimidating in powerpoint presentations, but the art interpretation is beautiful and may even help us visualize those nasty equations. I recently got the opportunity to join a similar collaboration as this summer the island of Texel will host an art tour called S.E.A. 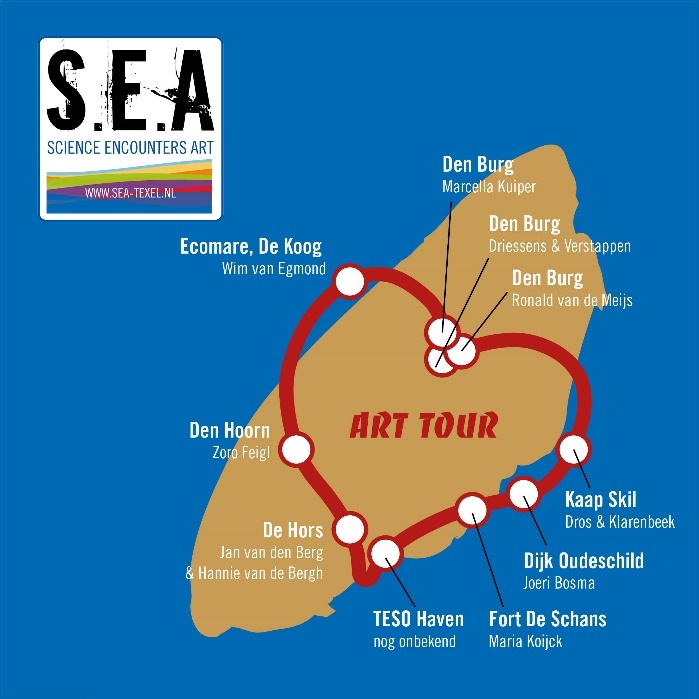 or Science Encounters Art [link https://www.sea-texel.nl/]. In this project, artist are paired with scientists from the Royal Netherlands Institute for Sea Research, also based on Texel. The artful interpretations of the scientist’s research will be displayed outdoors on the island for three months (an added complication on a windy island). 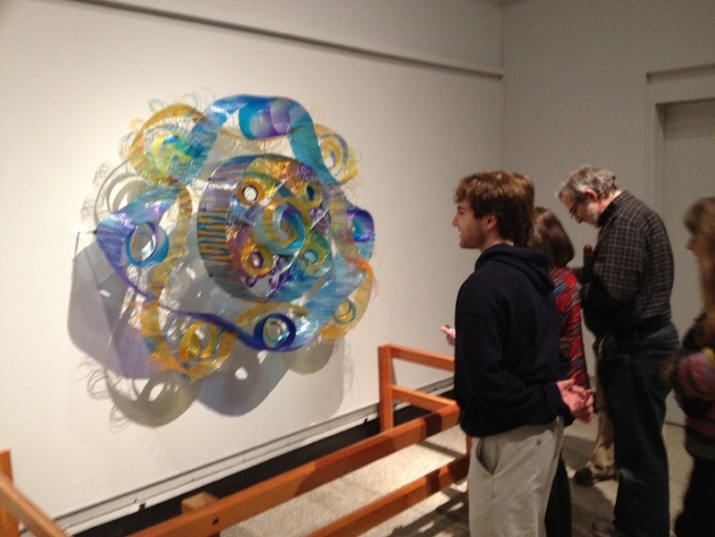 Around these sculptures, other forms of art like performance and poetry, will also be featured. Since I might actually be around for most of summer this year (no OSNAP cruise for us) this sounds like a really cool thing to experience. The particular collaboration I’m involved in at S.E.A. is a little bit special because it does not involve one artist. I was matched with a group of students at the Gerrit Rietveld Academy of Art in Amsterdam. At the start of this project, during a visit of students to Texel, I was invited to give a presentation about my research. I explained about the ocean circulation, the OSNAP project and showed some videos of how we go about doing measurements at sea. This resulted in a ton of further questions, which I was happy to answer. Alter that week the students presented their first thoughts on possible projects. For the students this is a learning experience as well as an art project as this is their first commissioned project. Besides coming up with an inspiring idea they need to think about practical realization, budgets, logistics (does anyone think this almost starts to sounds like organizing fieldwork…?). A few weeks after the first introductions I was invited to the Rietveld Academy to come and listen to the presentations of the students plans. It was great to hear the very different interpretations and links they had made. Plans varied from man-sized wavy blue slides that represented current motions (and may feature some during rainy days) to an ironic video documentary on fake science. Currently the students are working out their plans in more details to see which ones can be realized. There will not be enough space and money to accommodate all the student projects, but the plan is to build as many as possible. Next to the students I’m also working with Alkmaar’s city poet, Joris Brussel. I invite everyone to come see and read (or hear) the results on Texel this summer. I have always been interested in advances in science that seemingly happen overnight. I love the stories of someone walking through the woods when a new idea or solution to an old problem comes to mind, and then the next day he or she tests something in the lab, makes some calculations, or runs model simulations to check things out, and science is rewritten. Then there is the slow science of ocean observations, where almost nothing happens overnight. Take OSNAP, for example. Our first OSNAP time series will be published in the February 1st 2019 issue of Science, almost 12 years after OSNAP was first conceived. There is nothing ‘overnight’ about this program. Not even close. In July of 2007, I was in Woods Hole, co-chairing the committee for the implementation of the US AMOC Program. At lunch one afternoon, sitting outside of a restaurant on Main Street in Falmouth, Bill Johns, Molly Baringer and I were discussing the success of the RAPID program and the new modeling results that were pointing to the disconnect between AMOC measures in the subpolar and subtropical regions. At that lunch, the three of us agreed that we needed an AMOC measure of the overturning in the subpolar basin. And so on that warm July afternoon the OSNAP seed was planted. Fast forward three years to April of 2010 when OSNAP was largely planned at a North Atlantic Subpolar Observational Program Workshop, which I hosted in Durham, North Carolina. While I like to think that the workshop participants remember this workshop because of the beautiful weather, great conversations and exciting science plans, I am aware that many remember this workshop because of the volcanic eruptions in Iceland during our meeting. Ash from Eyjafjallajökull thwarted many Europeans’ plans to travel back home, and they were stranded in North Carolina for a few extra days. Considering how lovely spring weather is in North Carolina, it was not a bad deal. After that planning meeting in 2010, one of the first items on the agenda at the 2nd meeting of the U.S. AMOC Science Team in Miami was to name our new program. We rejected a fair number of clunky nominations until we settled on OSNAP, a suggestion by my then 19-year old son, Joseph, who used this term quite frequently in conversations with his mother. At this point, I would be remiss if I did not call out the contribution and support from funding agencies and the program managers at those agencies. OSNAP would have gone nowhere fast without that support. Dave Legler and Eric Itsweire were instrumental to making the Duke planning workshop, funded by the US AMOC Program, happen. And Eric (program manager at the National Science Foundation) worked closely with Mike Webb at the UK National Environmental Research Council to coordinate the review of OSNAP proposals on both sides of the Atlantic. OSNAP proposals went in in 2011, and then again in 2012 until funding came through in 2013 from the National Science Foundation for the U.S. contribution and from the National Environmental Research Council for the UK. The observing system was put in place in the summer of 2014, and the first data recovery finished the summer of 2016. A long road indeed, but it can hardly be any other way with a program of this scope and size. And, as with any long journey, it is great to have companions along the way. OSNAP came together because funding agencies in the US, UK, Germany, Canada, Netherlands, France and China invested in this science and because oceanographers from these countries worked together on this common goal. I have been extraordinarily fortunate to work with such extraordinary oceanographers. The wait has been worth it. If you get a chance to read our Science article, I hope you agree. For now, OSNAP remains in the water, while we analyze more results, apply for more funding and enjoy the long game in ocean science. The end of the year is a time to reflect on the past and make long-term plans for our future. Some readers of this blog, especially our young audience, may be considering a career in oceanography or climate science. I will tell you my story: what motivated me to join this field and the factors that shaped my career path. My first encounter with physical oceanography was 14 years ago, at an international summer school where I learned basic gravity wave dynamics. Fluid motion fascinated me and sparked a lasting interest in the field. The following year I was on my high school team for the International Young Physicists’ Tournament (IYPT). Within our team, I was responsible for problems related to fluid dynamics. By the time I began my undergrad studies, I was already very interested in modeling the environment. I also realized that to do well in the natural sciences, I should expand my background in math. So I majored in Applied Mathematics, but I also took physics courses. As an undergrad, I did different research projects applying mathematical methods to study the environment. For example, my senior thesis was on modeling the El Niño / La Niña phenomenon. Nine years ago, I decided to do a Ph.D. in climatology and oceanography. I became interested in the field because I wanted to do research in an area of science that is socially significant. Nature has direct impact on humankind. At the same time, climate science and oceanography attracted me because many fundamental questions in our field remain unresolved. My Ph.D. and postdoc research has explored the large-scale ocean circulation and its impact on global and regional climate. I have studied various parts of the World Ocean: the North Atlantic, the Arctic Ocean, and the Southern Ocean. My work involves coding algorithms and analyzing data from complex climate models and observations, but also developing simple conceptual models. In my current OSNAP project, I examine how the ocean circulation in the subpolar North Atlantic responds to local and remote fluctuations in atmospheric conditions. I analyze the computer code of a global ocean model as if it were a system of math equations. One of the most interesting aspects of my work is trying to understand the ocean’s delayed response to past atmospheric changes that took place years ago. I am now looking forward to another productive year of research on the ocean circulation. Happy holidays to all readers of this blog and best wishes for the New Year! The sea and the ocean have always held a fascination for me. 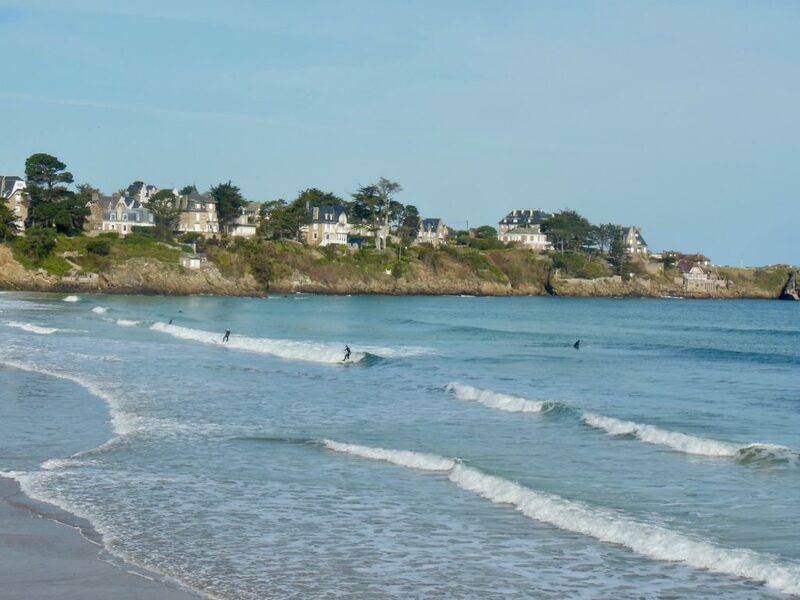 I grew up in the bay of Saint-Malo (France) and the sea coast was my first playground (Figure 1). During my childhood, I was mostly interested in the processes involved in sandcastle destruction by waves, or in the tide processes that could not be ignored for safe crab fishing. When I was a little older (and braver), I started exploring the sea and left the beach and the rocks behind me. Sailing, surfing, windsurfing and kayaking became my favourite hobbies. Boat rides were always fun and exciting. Visiting traditional sailboats or big fishing vessels were captivating and it nourished my imagination and my dreams of sea adventures. I used to think: “One day, I will also be on a boat to explore the ocean and learn more about it!”. Figure 1: My playground back home (Grande Plage de Saint-Lunaire, France). Photo by: Charlène Feucher. I would later discover oceanographic sciences: the ocean was not only my playground anymore, it could now be my field work too! I was very glad to start a master in physical oceanography at the University of Brest (France) and learn the secrets of the ocean (with an affinity for the Atlantic Ocean), how it works, and why its role is of paramount importance to the global climate. During my master studies, I got the opportunity to complete two projects that introduced me to physical oceanography research. My first internship was at IFREMER and IUEM (Brest, France) to evaluate realistic hydrodynamic simulations for biogeochemical applications. I developed inter- comparisons of several ocean simulations (differing in resolution and model parameters) and evaluated the simulated fields against relevant observation data sets, with a focus on mixed layer dynamics in the North Atlantic Ocean. I did a second internship at Woods Hole Oceanographic Institute. The project was to study the dissipation of the North Atlantic Subtropical Mode Water (also well known as Eighteen Degree Water) based on eddy-resolving ocean simulations. I examined the eddy covariance flux divergence of the North Atlantic Subtropical Mode Water thickness and potential vorticity to understand the spatial distribution and mechanisms of the destruction. After my master thesis, I came back to the University of Brest to complete my PhD. The objective of my PhD project was to evaluate the properties and variability of the stratification in the North Atlantic subtropical gyre. I developed a method to characterize the properties of the stratification of the ocean (permanent pycnocline and mode waters) in subtropical gyres. 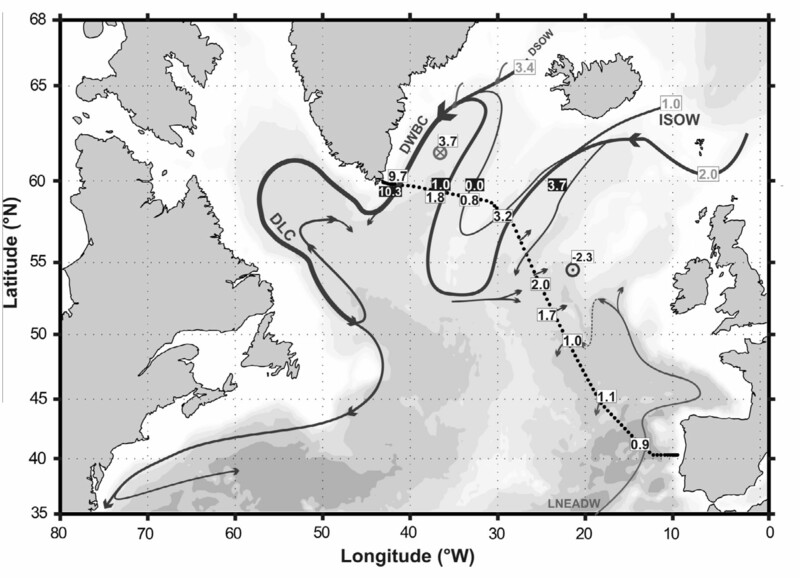 Focusing on the North Atlantic subtropical gyre and based on the use of Argo data. I have documented the properties of subtropical mode waters and permanent pycnoclines. Right after PhD, I travelled to Canada to start a postdoc at the University of Alberta (Edmonton) where I am still working. My postdoc research focuses on the relationship between the meridional overturning circulation and the formation of the Labrador Sea Water. This study is based on the use of NEMO model outputs with an Arctic and Northern Hemisphere Atlantic configuration. In Edmonton, I am living far from the ocean but I never forget about it. The sea is always calling me and when cruise opportunities are out, I am willing to embark when possible. My first experience at sea was in 2015 during my PhD. We took several measurements along and across the Reykjanes Ridge to study the ocean circulation there. This first research cruise was full of discoveries. I learnt what oceanographic field is all about, how to take measurements, and how life aboard a ship feels like. I was enchanted by the immensity of the ocean and the power of the winds and waves during strong storms (small storms according to the Captain but I was not convinced). I got the chance to renew this sea experience in June 2018 on board of the RV Maria S. Marian. This cruise was quite epic! We flew to Cadix (Spain) where the boat departed. We crossed the whole Atlantic while taking measurements, we docked in St. John’s (Canada) for a day and then we crossed the whole Labrador Sea before coming back to St. John’s where our cruise ended. Seven intense weeks at sea! During this cruise, I was amazed to see icebergs for the first time, admiring them drifting off the Greenland coast under a beautiful sunset (Figure 2). Performing CTD casts with the Greenland coast in the horizon was also a very special moment (Figure 3). And more importantly, I was glad to take measurements in the Labrador Sea to observe deep convection and compared these observed results with what we simulated in our NEMO model. Figure 2: Sunset and iceberg, from the RV Maria S. Merian in June 2018. Photo by: Charlène Feucher. Figure 3: CTD cast near Greenland coast, from the RV Maria S. Merian in June 2018. Photo by: Charlène Feucher. Physical oceanography research work gives me the opportunity to work in different places and and meet many great people. This is full of very enriching experiences, professionally but also personally. I hope I can continue this oceanographic adventure in the years to come. 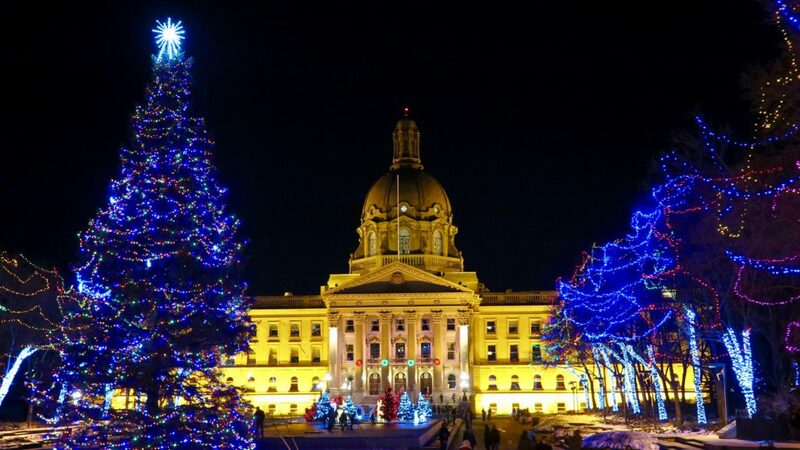 As this is the last blog post of 2018, it is time to leave you wishing everyone a wonderful Christmas season from a freezing cold and white Edmonton! Now that temperatures outside are dropping and storms are raging over the subpolar gyre, it is clear that the OSNAP field season had ended. Many blogposts have been written about the exciting adventures at sea last summer. This time however, I would like to tell you a bit about the – slightly more boring – work that happens after. When the exhausted but ultimately satisfied scientist returns home, with a hard drive full of newly recovered data; that’s when our real work begins. Before the new data can be used to answer actual science questions, they are in dire need of some cleaning. Why is that necessary? Instruments on a mooring (a cable anchored to the sea floor) are impacted by currents, storms, tides and sometimes fishing activities. There is the risk of colonization by omnipresent sea creatures. In the vast open space of the ocean, an instrument can provide a welcome place for shelter. Instruments deployed in the sunlit surface layer are all overgrown with algae upon recovery. But deeper instruments can also host interesting inhabitants, such as the anemone in the picture below. Last but not least, the ocean is salty, wet and under high pressure. A challenging environment for an electronic instrument, especially with our long deployment period of two years! Figure 1: Some examples of sea life on the moorings upon recovery: a slimy creature on a Microcat, an anemone growing on a ring of the release that was at almost 2000m depth, and a shallow UK buoy overgrown with algae. Data quality sometimes suffers from all these environmental impacts. This is where my work of the past few weeks comes in: checking, cleaning and processing the raw data records. Below are examples of Microcats on one of our moorings, called IC2, during the last deployment. Unlucky for us, the anchor of this mooring ended up shallower than planned, on top of a small seamount. A storm resulted in the exposed top buoys breaking down, making the shallow instruments sink to the deep. The top Microcat, originally at 25m, was instead dangling loose at around 700m depth… it is a small miracle it was still attached to the cable when the mooring was recovered! Severe storms impact the mooring even deep down in the water column. The pressure record of the Microcat at 352m depth (figure 2) still shows many big and small ‘blowdown’ events. During such an event, strong currents push against the mooring cable, blowing it down at an angle and pushing the instruments deeper into the water. When the storm ceases, the buoys on the cable pull the mooring cable back to its original straight position. Microcats also measure temperature and salinity. Figure 3 shows the raw salinity record from the deepest Microcat on IC2, close to the bottom at almost 1900m depth. As you can see, salinity differences in the deep ocean are generally very small. However, salinity measurements are notoriously noisy, so we need to perform some filtering of data spikes. But which spikes are bad data, and which represent real variability? Then there is a suspicious drop at the start of the record; perhaps a small animal or algae was temporarily covering the sensor? Lastly, and perhaps most importantly, we need to perform a calibration for all sensors. From the ship, we dip the instrument into the ocean and test its readings against a calibrated reference sensor to determine any offsets, both before and after the deployment. This is the only way to check whether an instrument gives accurate readings. Overall, it is probably clear that there is a lot of effort involved in scrutinizing the records and ensuring data quality control is performed correctly. But although it may sound a bit tedious, the quality control step is extremely important. It ensures that we have accurate, reliable records, on which we can build for further analysis – to eventually formulate valid answers to scientific questions! No, not an OSNAP cruise this time, but in the balmy subtropics at 26°N. I am leading a group from the University of Miami and NOAA’s Atlantic Oceanographic and Meteorological Laboratory (AOML) on this 18 day cruise, where we will recover and replace several deep moorings and collect hydrographic profiles near the ocean’s western boundary off the Bahamas as part of the RAPID/MOCHA program (http://www.rapid.ac.uk/rapidmoc/). One of our key goals is to monitor the strength of the Deep Western Boundary Current (DWBC) that carries deep waters formed in the subpolar region southward toward the equator, in the lower branch of the Atlantic Merdional Overturning Circulation. 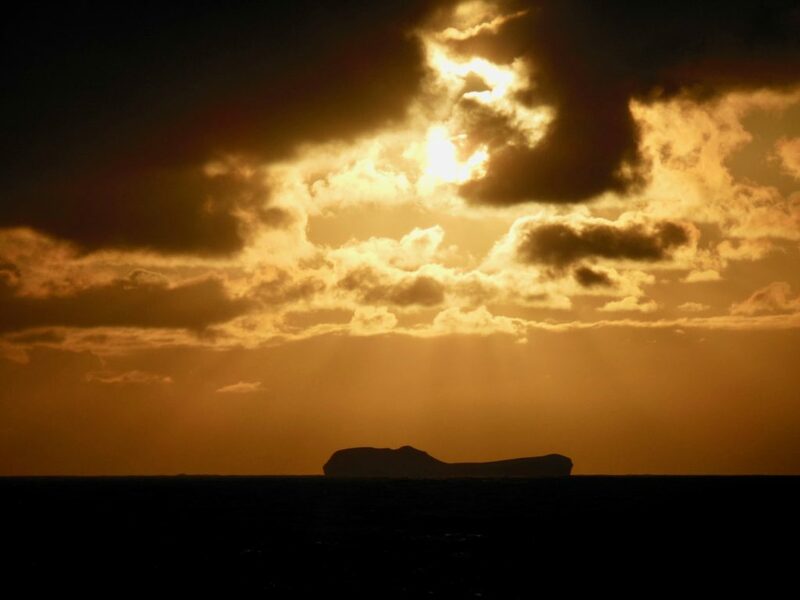 Unlike our OSNAP cruises, we are wearing t-shirts on deck and scanning for the elusive “green flash” on clear days at sunset – a somewhat more comfortable existence to be sure, but as on all cruises the work is nonstop. We’ve experienced a short November gale on this cruise that shut down our sampling for awhile, but we are mindful of the fact that we’d much rather be here now than up in the high North Atlantic! The last CTD recovery before shutting down our overboarding operations. Bahamas, again just about 9 years after the peak of deep convection in the Labrador Sea in 1994. Since that time the waters in the DWBC off Abaco have gradually warmed, while deep convection in the Labrador Sea has generally decreased. All that changed in 2014 with the onset of very strong cooling again across the subpolar gyre and extensive deep convection in the Labrador Sea – coincidentally (but auspiciously) timed with the start of OSNAP. If this turns out to be a sustained multi-year event, which it seems to have the makings of, then the next several years will be very interesting. Will this be a playback of the mid-90’s event, or will something different happen? We know the ocean is taking up a great deal of the excess carbon dioxide we are putting into the atmosphere, and that the deep water mass formation in the North Atlantic is a key element of that uptake. What we know much less about are the pathways and processes by which carbon is transported and stored in the ocean and he time scales of those deep ocean transport processes. Obviously we’ll have to wait a while to find out what happens, but the difference this time around is that we will have the OSNAP, RAPID, and other deployed AMOC arrays, as well as the fully-deployed Argo array, to help us out. THAT is progress.